By Ashutosh KS in Internet. Updated on May 17, 2018 . When you own a website, there’s a lot you can learn about your visitors and their behavior on your site through web analytics. For that very purpose, there are web analytics tools. You can find certain open-source web analytics options and then there’s the famous Google Analytics. However, the deeper you get into the web business, the sharper statistics you require on your website – and from sharp, I mean real-time analytics. So, here are 5 of the best real-time web analytics services you should be looking into to get better insights on your users. Woopra can tailor insights by using in-depth segmentation and customized reports to place the relevant analytics right in front of you. It helps analyze and improve conversion rates by reporting where your visitors drop off in the conversion process. 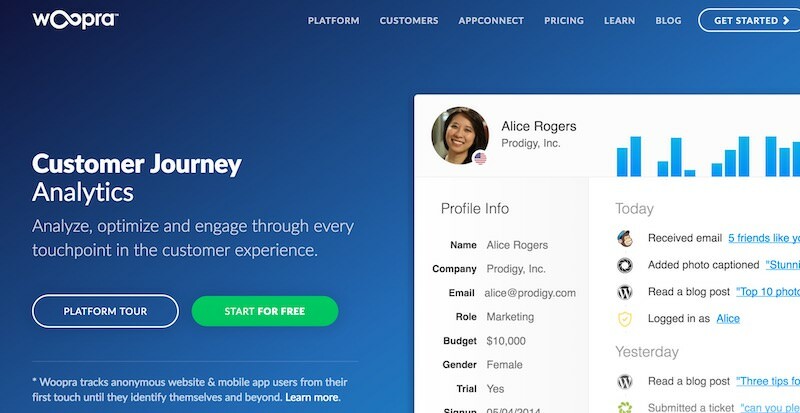 That way you can also check user retention and increase customer lifetime value by engaging them with your offerings. Woopra is free for 30 thousand actions (views or events) per month. Though it handles small to medium traffic websites without any issue, yet it is not suited for high traffic sites because traffic spikes delay its real-time data analytics feed. 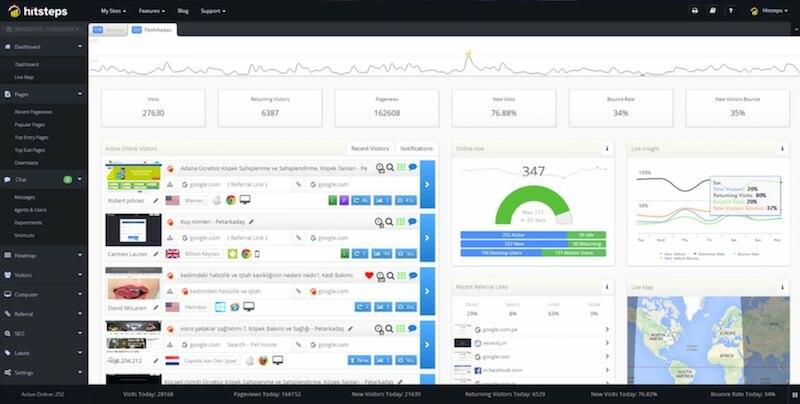 With Woopra, you can monitor multiple websites simultaneously in the same dashboard using a tabbed interface. Moreover, you can pin reports on its dashboard for checking out a quick overview of the customized analytics of all sites. 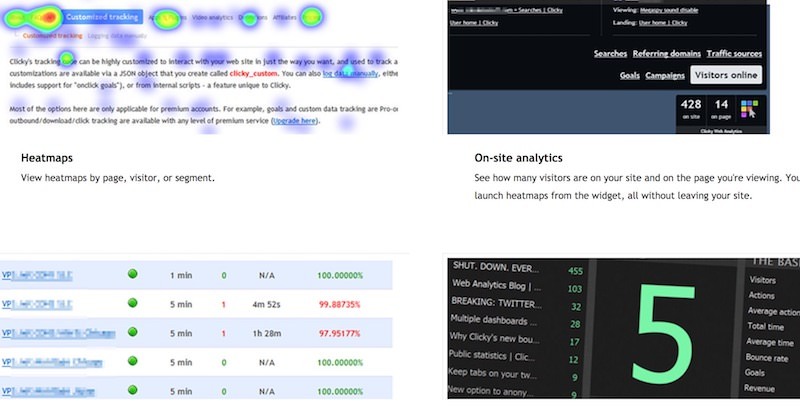 Hitsteps helps monitor visitors’ behavior in real-time through heat maps for every page to identify your best-selling point and traffic sources (a feature missing in Woopra). It also tracks and correlates visitor profiles across devices using profile aliasing to help you understand them and convert them to your customers. Hitsteps is free for one website with under two thousand views per month. Though it is ideal for tech-savvy people or experienced webmasters who are experienced in traffic analysis, yet it may not prove equally helpful for beginners. Hitsteps allows you to download detailed reports on keyword statistics as well as many more analytics reports in PDF and CSV formats, which I find useful for third-party use. Moreover, unlike Woopra, it works as a 4-in-1 service for marketers and webmasters by providing web analytics along with live-chat, page analysis, and uptime monitor tools. GoSquared shows individual visitors with details including length of stay and visitor journeys that help you to understand sources and actions. You get actionable analytics with ability to include or exclude anything from traffic to other data items. You can also track real-time count of visitors with up-to-the-minute stats that works perfectly for high traffic sites as well, unlike Woopra. 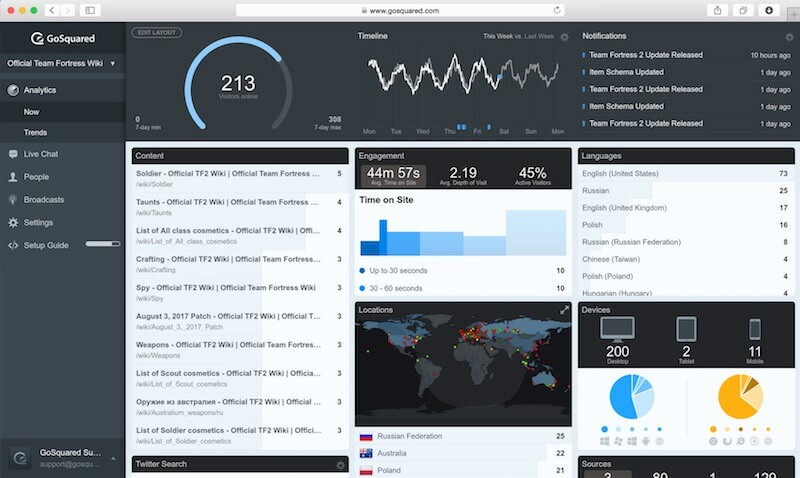 GoSquared Analytics offers just a 14-day free trial (unlike Woopra that offers a free plan for basic usage). Its analytics lacks predictive analysis and online analytical processing (OLAP) compliance to predict trends and behavior patterns. Also, automated or scheduled reporting feature and funnel analysis are not available on its dashboard. What I liked that it packs an assistant tool, a live chat tool, and a CRM in the same package along with analytics, meaning you get all the required tools. It also provides many integrations to help you connect it directly to other tools and services your team may use, including Slack, Twitter, Zapier, etc. 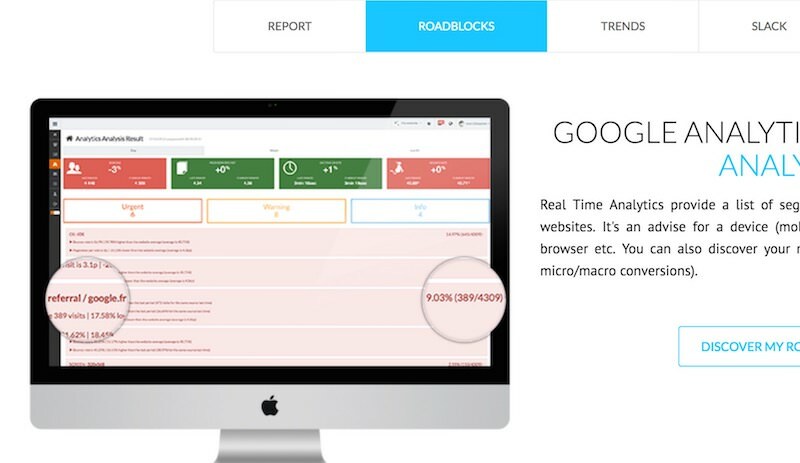 Real Time Analytics analyzes multiple channels for past and real-time traffic to provide an accurate projection of traffic trends on your website. It helps grow a website’s performance by auto-segmenting views, analyzing them, and foretelling the segments that need optimizations. The tool also helps to examine trends and roadblocks and provides real-time traffic details of multiple sites to support taking actionable steps. Real Time Analytics does not gather data on its own (unlike other tools on this list) and takes the analysis from Google Analytics. Its free subscription is available for limited time only that allows 200 requests every 24 hours and five daily, weekly, and monthly email reports each. In Clicky, you can customize its dashboard to highlight the important metrics to track your goals and campaigns efficiently. It presents reports in real-time with up-to-the-minute details, proving essential tool at the time of a spike in visitor count from an external source. You can also monitor Twitter tags, keywords, and retweets using its “Twitter Search Tracking” feature, which I find missing in few services given above. Clicky allows you to track just one website for free if it has less than three thousand page views daily. It does not enable integrations, i.e., you cannot connect to other apps and services. Also, I do not find its interface as impressive as the other services on this list. Moreover, its paid features include on-site heatmaps for identifying spots with a high volume of traffic, which supports further segmentation by goals, sessions and split tests.